What constitutes a building worth saving? A performance at the Bob Baker Marionette Theater, March 2014. Photo Courtesy of Leslie Henry. Curbed LA recently featured an article about the likely conversion of the Bob Baker Marionette Theater into a five-story mixed-use building project. As the article notes, the sixty-one year old building in downtown Los Angeles has faced a number of threats in the last six years, including a near-foreclosure, and official designation by the City as a Los Angeles Historic-Cultural Monument in 2009. So what does this latest development (pun intended) in the history of this building mean for this beloved theater? And if the puppets leave, is the building even worth saving? If you’ve never been to a show at Baker’s Marionette Theater, you’ve missed out on a real treat. I attended a performance for the first time last March, and it was unlike anything I have ever seen before. Magical is one way to describe it. The amount of skill and sense of timing that go into performances is unreal. The young children in the audience were entranced, and they had the opportunity to commingle with the puppets and puppeteers after the show. The Theater has occupied the building since 1961, and initially hoped to stay in its location on First Street indefinitely. The proposed development would include nearly 100 apartments and some commercial space, with plans to preserve the theater space and incorporate it into the new building’s design. The developer reportedly plans to move the puppets out and use the space as a residential lobby. In the midst of all this, the health of 90-year old Bob Baker has rapidly declined and he is currently receiving in-home hospice care. The Theater’s managers and employees are left with an uncertain future, and there are conflicting reports on whether the Theater will relocate. 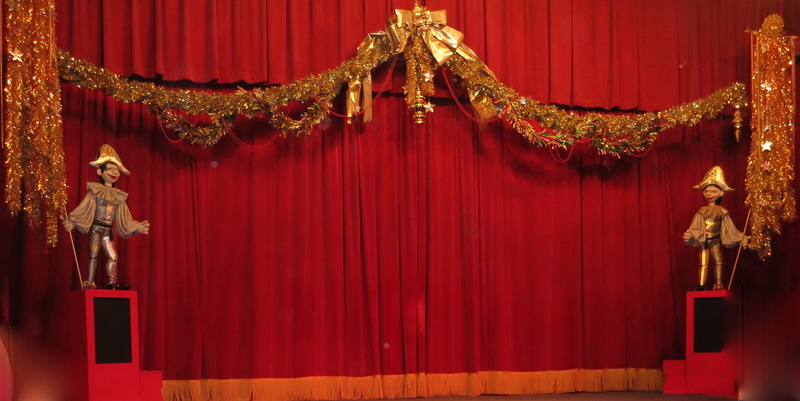 The interior of the Bob Baker Marionette Theater, March 2014. Photo by Andrea Thabet. Here’s the million dollar question: Is the building even worth saving, despite its designation as a Historic-Cultural Monument, if the Bob Baker Marionette Theater leaves? The building itself is not very attractive–it is a boxy, white building with little architectural value. Yet, in the messy world of historic preservation, buildings like this one can be designated a landmark because of the site’s history and cultural significance. Its historic status is aimed at protecting it from destruction. But if the Theater leaves, must the developers still incorporate the Theater space into the new building? The Cultural Heritage Commission is responsible for overseeing any proposed changes to the building, and the President of the Commission believes that without Baker’s Marionettes, “you don’t have a monument anymore. It’s been hollowed out.”  The Los Angeles Conservancy has yet to take a stand on the preservation of the building, in part because the organization has not quite decided what form “meaningful preservation” of the Theater should look like. In the meantime, historic preservation advocates are left to debate the issues on their own, and for now, audience members have limited time left to take in a show before the Theater closes or relocates. Bianca Barragan, “The Bob Baker Marionette Theater Could Become a Mixed-User.” Curbed LA, October 15, 2014.